When Arron was working to get his license, he knew he was never going to be the agent out knocking doors and calling long-forgotten acquaintances for business. He also had over 20 years in the restaurant business, where he had come to understand the importance of local word of mouth and long-term service. 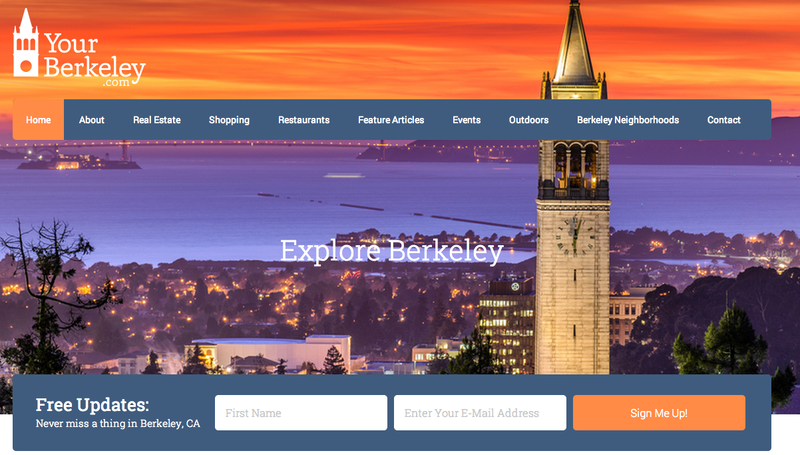 Last, his natural interest in inbound marketing and love for his newfound home base of Berkeley (he moved from San Francisco after getting married to join his wife in the East Bay) made the local content route all the more appealing. The reality of local content is that you’re first going to attract visitors by geography, and only a fraction of those visitors will ever become “leads.” In order to ensure he was casting the widest net possible when drawing hyperlocal inbound links, Arron created both neighborhood landing pages, as well as other niche (but still local) categories like “outdoors,” “restaurant reviews” and more. The call to action on his home page is — GASP! — not a real estate search bar, but a widget that collects email addresses for his weekly email newsletter. After less than three months, Arron has already generated the contact info for 350 local residents. Huge may be an understatement, in this case. As content marketers, we tend to remember those “time on site” and “page views per session” stats as huge Google coups, but minimize the fact that Google’s algorithm is meant to reward good content. So the next time you have a great victory in Google Analytics, remember to celebrate it in real life, too. Your readers are developing habits and coming to know you as an authority they can rely on — and you can’t quantify that. To create more “stickiness” and opportunities for multiple page views in one session, never lead a visitor to a dead-end page. Include cross-links to similar content when available, and have one (yes, just ONE) elevated call to action. Once you get those local leads, what are you going to do with them? It’s important to continue your local-centric approach, so don’t just put these contacts on a copy-and-pasted template available through your CRM. If you have great (and constantly refreshed) content, you can send a weekly email with links to your new posts, alongside links to new listings and open houses. If you’re looking for seller leads, remember to elevate calls to action surrounding home market analysis or breakouts of local home sales and prices. It’s so critical to recognize your limits, and not push past them. In many cases, the limit is time rather than capability. Arron wanted five to six new posts per week, and recognized this was beyond his personal bandwidth. 6. You’re the local expert! Use it to start new conversations! There are many ways to become a local expert, and I’ve outlined only one strategy here. How are you going local? Share your successes and missteps below. I’ll include the best tips in a follow-up article at the end of July. As marketing coordinator for Inman News, Gina Thelemann co-manages the InmanNext blog and works on email marketing and social media strategy. Contact Gina at gina@inman.com.